Bags | shoes, and other things. Yes, yes I do sag. Perhaps “melt” might be a more appropriate word. Yeah, I actually found all this quite funny. Horrifying, yes, but definitely funny too. Apparently this sagging can happen even if you leave your luggage tote in a cupboard and don’t use it – imagine not touching your precious Celine for 6 months, finally taking it out of its dustbag again aaaaaand it’s turned to goo. Mad depressing, but funny no? I think I would burst into hysterical laughter, then cry. Definitely cry. You can bet I’ll be monitoring my luggage tote over the next year! If it really starts sagging something horrific I’ll be sure to post pictures for you guys to see. I got it in Oct’12 and it’s grown some tiny wrinkles (just like my face…) but nothing major. To anyone with a luggage tote/trapeze/phantom (the main saggy culprits) of your own, have you experienced this with your bag? Let me know! Balenciaga is currently offering free Tiny Firsts and Tiny City bag charms for everyone who buys a Classic/Giant 12/Giant 21 Arena bag from their online site! I must say that this is one of the most generous GWPs (Gift With Purchase) I’ve seen a designer do, since these tiny babies cost a couple hundred dollars a pop at retail, plus they’re seasonal. What’s better than a Balenciaga bag? 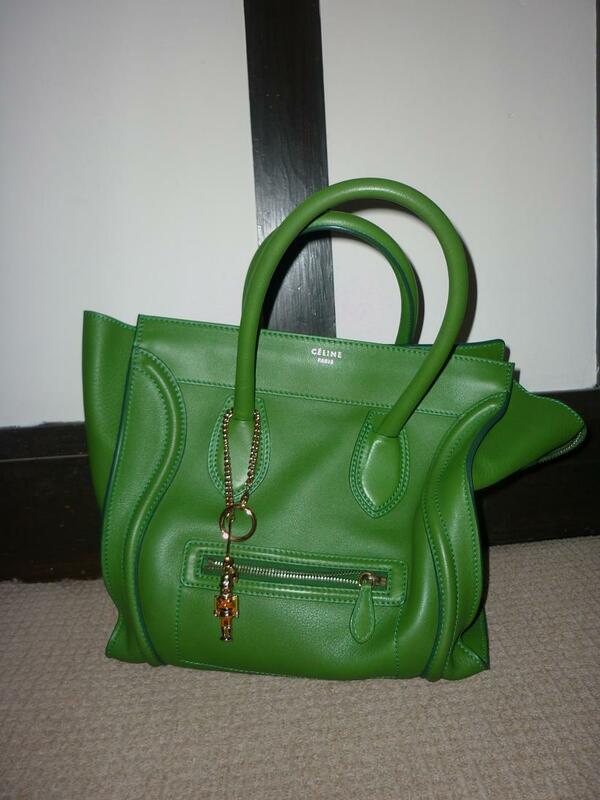 A Balenciaga with a tiny Balenciaga bag hanging off of it, of course! I bought this bag two weeks ago from the Balenciaga US Online Store (SO HAPPY), but no pictures of it yet because I literally took it out of its dust bag to admire and then put it right back in for my mother to help me carry back to Singapore! I’ve been eyeing this bag since the Spring 2011 colors first launched on the US site, naturally because of its lovely pink color – light enough to be girly but not scream bimbo! I wasn’t sure if it was just non-buyers’ regret that I didn’t get the Giant City Rose Gold in Bois de Rose from the Fall 2010 season, which I fell in love with the first time I saw, but a friend bought it so according to some Girls’ Law out there (like the female equivalent of the Bro Code, only this says you can’t buy a scarf in the same color as your friend or a bag they own already) I couldn’t buy it after I’d seen her carrying it. 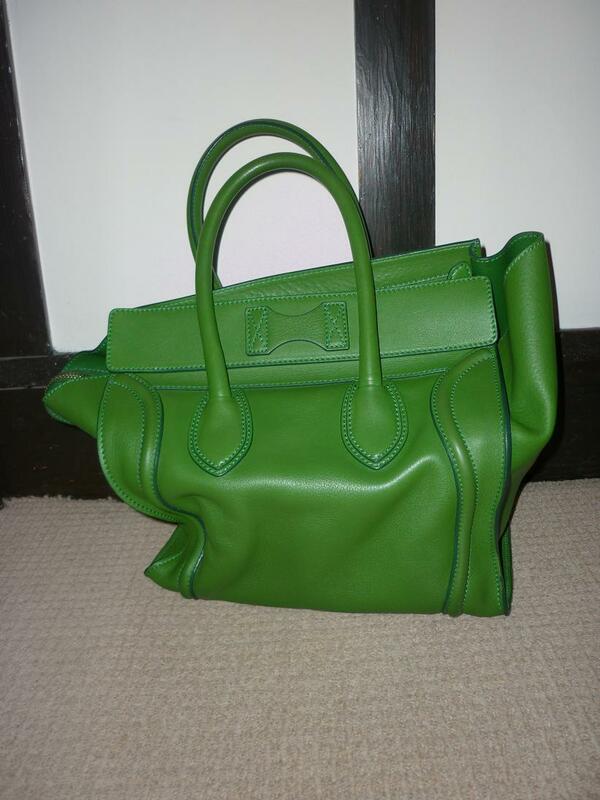 Especially since Balenciaga produces the same styles of bags, just in different colors each season! I was quite crushed, but it’s okay because apparently my friend’s bag (a very light white-pink) has since faded to gray, and you can’t really tell that it used to be pink. That’s what you get with Balenciaga I suppose, as the brand’s leather isn’t known to be the best and the color tends to fade! I think this color will still look gorgeous slightly faded though, and I like gold hardware better than the rose gold. I went down to Barney’s in Boston too see the bag in person, but they were out of stock and placed one on hold in New York for me. But when I went to NYC that weekend the store had none, even though their computer said that there should still be 4 somewhere! I managed to take a look at the other styles in this color though and knew that I definitely wanted the City in Old Rose, so I placed my order online and had it shipped to Boston. No sales tax 😀 I had it shipped via Complimentary Ground, and although the Balenciaga site has options for Next-Day and 2-Day delivery it still made it to me in 2 days, with the white Balenciaga box inside a nondescript regular brown cardboard box, and with signature confirmation in case anyone else tries to make off with my bag in the mail! Overall I’m very pleased with the Balenciaga online store and my new bag, and I’ll definitely be getting as much wear out of this bag before next season’s colors come out! This does match most things in my wardrobe (pink) after all.. 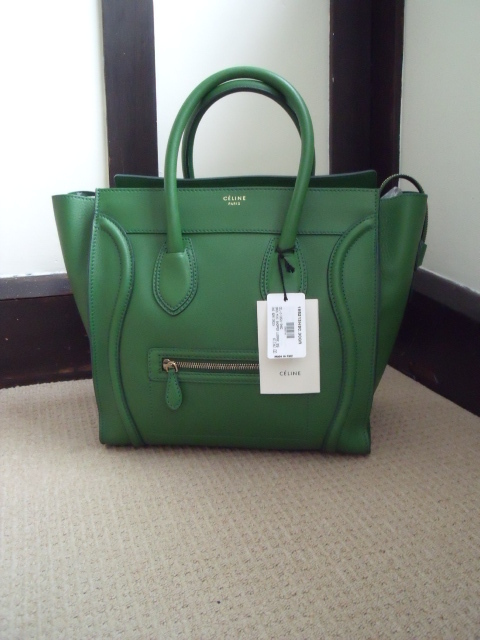 I don’t generally write about bags, though not for looking at them less than I do shoes! 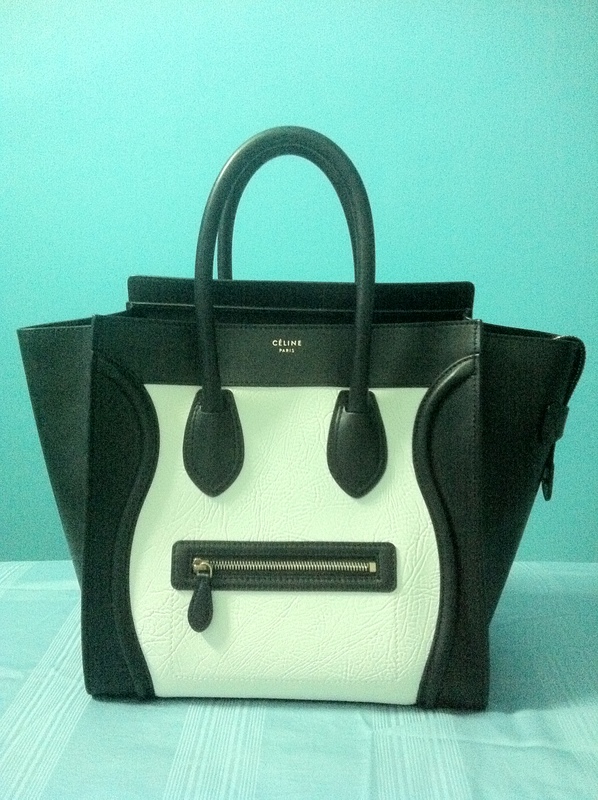 I should probably feature more bags on here, because who doesn’t like looking at bags? 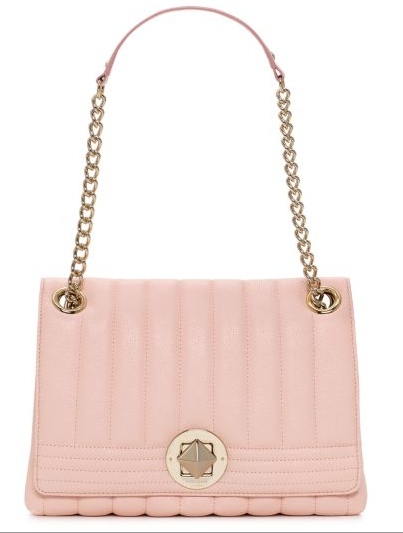 (Not me anyway…) This is Kate Spade’s popular Gold Coast Evangeline bag, shown above in ballerina pink. I really like this shade of pink because it instantly makes an item more delicate and feminine, and I think it works perfectly with the quilting and gold plating to make for a girlish bag. I like how this bag has its own distinctive look, unlike a lot of other quilted bags that tend to have the same look (ie, the Chanel Classic look…), due to the vertical quilting pattern and diamond-shaped clasp that have been used here. This is pebbled cowhide, with 14k light gold plated hardware and a flap and turnlock closure. You can purchase it here for $395. Also available in cream and cashew. If the price doesn’t faze you though, these charms should be available in Miu Miu boutiques now!